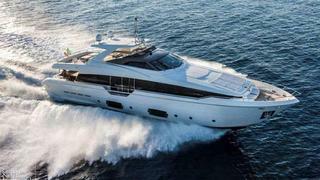 News from Camper & Nicholsons that James Rayner has listed for sale a 29.26 metre Ferretti motor yacht. Built in GRP by the Italian yard as one of their popular Ferretti 960 series, she was delivered in 2013 and large windows throughout make her light and airy. The interior is decorated in natural oak and walnut woods with white ceilings for a fresh, contemporary air. Accommodation is for eight guests in two double and two twin staterooms, all with en suite facilities in Corian. Interestingly, her master suite on the main deck has been converted into a playroom that also offers a large space suitable for meetings or watching movies. Outside, al fresco entertaining and dining areas are plentiful including a large flybridge with barbecue. Uniquely for a yacht of this size, she features a floodable tender garage. With her waterline hull length of 23.98 meters and LOA of 29.2m she falls just within the category that allows her to be driven without a yacht master or professional certificate – a considerable attraction for prospective owner-operators.